Kodi began life as the Xbox Media Center, an unofficial app for the original Xbox. Now it's coming to the Xbox One as a Windows Store app. The popular open source media manager Kodi is coming home. During Microsoft’s Developer Day event on Wednesday, Microsoft announced that the XBMC Foundation is bringing Kodi to the Xbox One as a Windows Store (UWP) app, as first reported by Neowin. The Developer Day event touted the advantages of the upcoming Windows 10 Creators Update to developers. We expect the Creators Update to launch in late March or early April, based on indications tied to the ship dates of Microsoft's Surface Studio and Dell's Canvas monitor. The story behind the story: Kodi began life as the Xbox Media Center, an application for original Xbox consoles that were modded to allow unauthorized software. Just as Kodi does today to PCs, XBMC turned the Xbox into a media streaming device. The program eventually became known as XBMC and left the Xbox platform to focus on PCs instead. 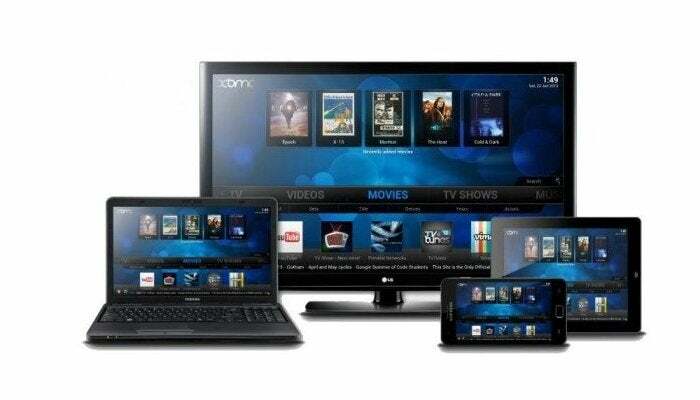 Since then, XBMC has become the open source project Kodi, which is managed by the XBMC Foundation. A slide from the keynote at Microsoft’s Developer Day conference. 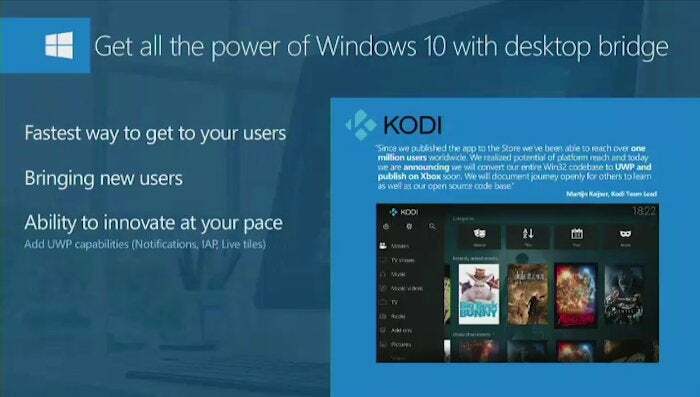 Kodi is already available in the Windows Store but as a Centennial app. That means the Kodi Team took the traditional desktop program (known as a Win32 app) and ran it through Microsoft’s mostly automated conversion process to turn it into a Windows Store app. Microsoft's conversion allows developers to do almost nothing to turn their desktop programs into Windows Store apps, but as they still use Win32 code, Centennial apps will only work on Windows 10 desktops and tablets.